Petroleum Corporation Ltd is www.bharatpetroleum.com before closing date 24-10-2018. Candidates will be selected through merit in written exam. 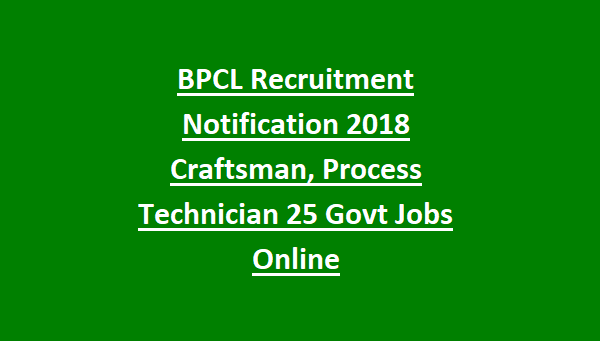 For the other details of age limits, educational qualification, available vacancies and how to apply are given below for the Craftsman, Process Technician job in Bharat Petroleum Corporation Ltd recruitment notification 2018. 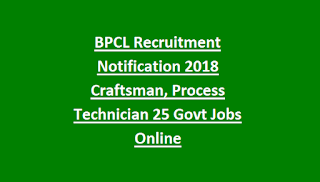 There are total 25 available vacancies for Craftsman and Process Technician posts in BPCL. And for ST category candidates the available vacancies are - 8 posts. The age limit for the General category candidates is in between 18 – 30 years as on 01-01-2019. 5 years age limit relaxation will be applicable for the SC/ST category candidates and PWDs belonging to SC/ST 15years age relaxation applicable. 3 years age limit relaxation will be applicable for OBC (NCL) candidates and PWDs belonging to OBC category 13 years age relaxation will be applicable. Age relaxation for Ex-servicemen will be applicable as per the Government norms. First Class (60%) Diploma in Mechanical/Electrical/Instrumentation/Chemical Engineering or Technology. The candidates will be shortlisted based their performance in written exam and based on merit in educational qualification. After written exam the candidates will be called for skill test. Eligible candidates can apply for the Craftsman and Process Technician jobs in BPCL through online mode only. The official website of Bharat Petroleum Corporation Ltd apply for these jobs is www.bharatpetroleum.com. The applications forms in online starting date from 29-09-2018 to 14-10-2018. No other mode will be accepted.